In need of a trustworthy Mazda Body Shop serving the Morrisville and Cary, NC area? We repair your vehicle the right way by following the procedures handed down from the factory. You can be assured that you are receiving only the most high quality service. Not only will we repair your Mazda, we will help you through the insurance claims process. If you live in the Morrisville or Cary area and have a Mazda that was involved in an accident, contact Triangle Collision at (919) 460-7693 or click here to contact us online! We stand behind our Mazda repair with Lifetime Warranties for many of our services. Your safety is our top priority. We guarantee that our repairs will keep your safety and performance features functioning as they were built to. Our dedication to excellent repair and service has helped us to build long lasting relationships with many of our customers. We want you to know that in the event of a collision, you will have a reliable Mazda body shop to turn to. We believe that you should never have to wonder if your Mazda was repaired the right way. We always follow factory recommended procedures and put your vehicle together the way the manufacturer intended. It’s your choice, not the insurance companies, where your vehicle is repaired. 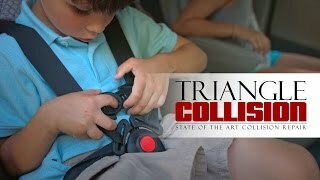 Choose Triangle Collision, the Cary, NC area’s premiere Mazda Body Shop & Collision Center. We emphasize our factory-approved repair techniques and tools because we know that it’s the only way to get the job done right. In order to achieve the performance and safety of modern Mazda’s, the manufacturers have had to invent increasingly complex designs. To maintain the integrity of the vehicle, these parts must be put back together the way the factory intended. We put in the effort and investments to stay up to date with the industry. We believe that our customers should trust that their vehicles are performing up to factory standards. The industry has been pushing for safer vehicles, and Mazda is among the highest rated for safety. New technologies are focused on not only protecting passengers during a collision, but preventing collisions from happening. These advanced features require specialized tools and understanding to repair after a collision. We are dedicated to providing only high quality repairs because the safety of our customers is our number one priority. We ensure that your vehicle will function as Mazda intended in the event of another collision. We have partnered with Lemon’s Wrecker Service to provide more convenient transportation services for our customers. By using Lemon’s you will be able to wrap your towing fee into your overall repair fee, making it easier to cover in your insurance claim. Let us take that claim off your shoulders. We know how to work with Insurance companies so that your vehicle is returned to pre-accident condition. Claims can be confusing, and are an additional stress that you do not need after being in an accident. You want your Mazda look just as good as it did prior to the collision. We can achieve this onsite with our paint facilities equipped with BASF technologies. Our paint services are backed by our Lifetime Warranty, and are guaranteed to match the factories original color.